Hey! You! Go here! I have my own domain now! I MIGHT even start posting again! Not that I wish ill towards the previous owner of www.chichimama.com, as her maternity clothes were tres cute albeit rather expensive, but I am thrilled that I could finally nab it! AHHHHH!.jpg, originally uploaded by chichimama's photos. 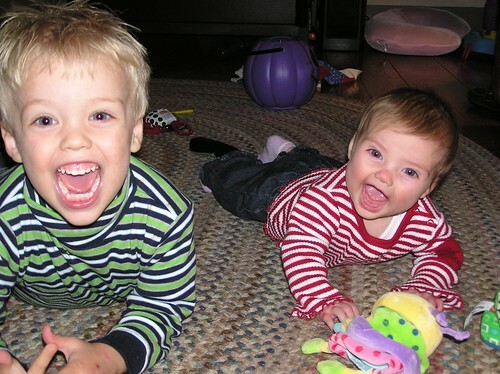 Now that my kids look nothing like this, I feel free to share this picture from OMG almost 4 years ago. I love this one. It pretty much sums up my kids in one fell swoop. A: "Mommy! Look! There is a NEW princess! Her name is Rapunzel! But why doesn't she have a movie???" Chichimama: "From your mouth to Disney's ears. I would LOVE to see what they would do to Rapunzel..."